I'm Proud to have been a speaker at Craft Content Nashville's "Unconference" for the Marketing/Tech/Content Creating Community! I did it! I faced my fear of public speaking, and delivered an inspiring presentation on "Ignite your Passion" at Craft Content Nashville (#CCN18)! Several friends weren't able to make it, so decided to turn my presentation into a blog post. Following is my presentation (with context), as presented at Craft Content Nashville on Saturday, April 21, 2018 at Nossi College of Art. Voice, Vulnerability, and Bravery- They are all connected. The fact that this year’s Craft Content Nashville theme is “Voice” is what really inspired me to be brave and speak up to share my story with you. You see, I’m not the same as I was a year ago today. I probably would not have gotten up in front of people to speak, and certainly not on such a personal topic. I was feeling unhappy and stuck. I was in a relationship that was going in circles, in a job that wasn’t the best fit. I felt trapped, but then again I was comfortable. I thought I had time to figure it out, or that it would work itself out. I wanted change. Little did I know I was about to get my wish. About 8 months ago, I found out that my long term boyfriend of 7 years- that I lived with- was cheating on me. I’m not going to get into the gory details, but if you really want to know- buy me a drink and I’ll tell you all about it! Needless to say, I took my cat and moved out into my own place. Four weeks later, I lost my job. Everything I thought was stable in my life suddenly was lost. I was lost. I was devastated, and had to pick myself up and figure out what to do with my life. I learned how to find my voice, I got vulnerable, and I got brave. Fast forward to today- I’m strategically pursuing my next career move in digital marketing. I’m regularly blogging about the things I love- Nashville, Marketing & Karma. I’ve discovered the joy of yoga and meditation, and I have plans to take the teacher training to become a yoga teacher. I am finding ways to bring joy into each and every day. I’m here to encourage you to identify and ignite your passion. I will share what has inspired me along my journey, and the things that I have found to be helpful in pursuing my passions. Do you know what happens when you ask a lot of people for advice? You get a lot of opinions! I was overwhelmed by my own emotions, along with the voices of everyone else (kindly) telling me what to do. I found yoga and meditation to be the only ways to connect inward and listen to my inner voice. Try it for yourself. 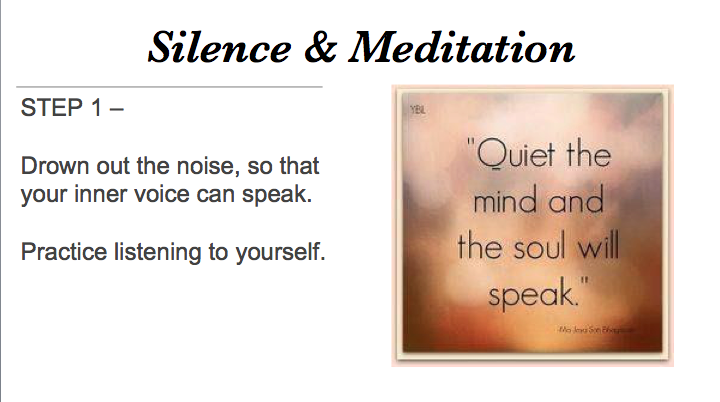 Start with a 1 minute meditation. Close your eyes, take a beep breath, hold it, let it out. Listen to your breath. Listen to yourself. I read a book that changed my perspective on how I thought about bringing into my life what I want to achieve. It’s called, "The Desire Map" by Danielle Laporte. Instead of thinking about goals in terms of wanting a job that fits an exact job description I envisioned, or a list of locations I want to visit, I started thinking about how I want to FEEL. I want to feel free, creative, connected, peaceful, adventurous, and inspired. Think about what you want to feel, and make THAT your guiding light in decision making. Planning- This is where you take action in bringing those desired feelings into your life. Not just long term goals, like one day you want to travel to Greece to feel adventurous, or you want to earn a certificate or degree. What feelings are calling your name? You don’t have to wait to feel those feelings! Let’s talk about mine: For me, blogging gives me a sense of freedom and creativity. Yoga makes me feel peaceful and connected. Once a week, I find adventure by going to a new yoga class (different teacher or studio), or going somewhere I’ve never been before. I have found inspiration in meeting new people. I’ve been reading books abut things I’m interested in. Did you know they let you borrow books for FREE at the library?! It’s amazing! 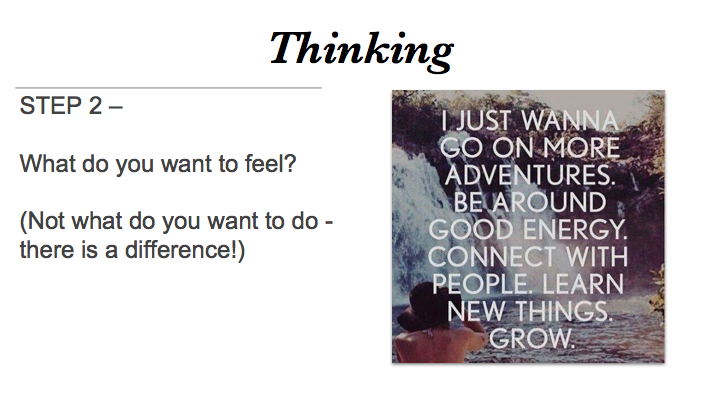 And by sharing my Craft Content Nashville presentation, I am inspired to inspire you! What you seek, you shall find. Is anyone else hesitant to get up in front of a crowd and speak? Please tell me I’m not the only one fearful of this! I struggled with the negative, nasty thoughts that told me I can’t do this, or that you wouldn’t care, or that I would fail. But you know what, that’s fake news! It is not always easy to shut out the fear and be brave anyway. I pretty much have no comfort zone anymore, and I’m okay with that. I’m embracing the journey. If you practice meditation- listening to yourself, get vulnerable about what you want to feel, and make an effort, you will know in your heart what is worth being brave for. In yoga, we close each class with the word "namaste"- which translates to “ The light in me honors and appreciates the light within you.” I love this because it signifies a community, a bond with other people coming together to share their practice together. No one is perfect. We are all working on our own personal practice. – Just like everyone that attended Craft Content Nashville, and YOU reading this. We are all seeking something. When I was preparing to speak at Craft Content Nashville, I reached out to some of the other speakers for advice, and asked friends who regularly speak at conferences for tips. It takes a village! It’s okay to ask for help. Use your resources. That’s what’s so great about the Nashville community. We help each other! I encourage you to connect with others, use your voice, share what you desire to feel, and ask for help in igniting your passion. Feeling inspired yet? Let’s connect! Please reach out to me and let me know how I can help you. I'm on LinkedIn at linkedin.com/in/georgiacross and on Twitter at @crossga. And if you are interested in following along as I share my continuing journey and inspiration via my blog, subscribe to get email alerts of new blog posts.